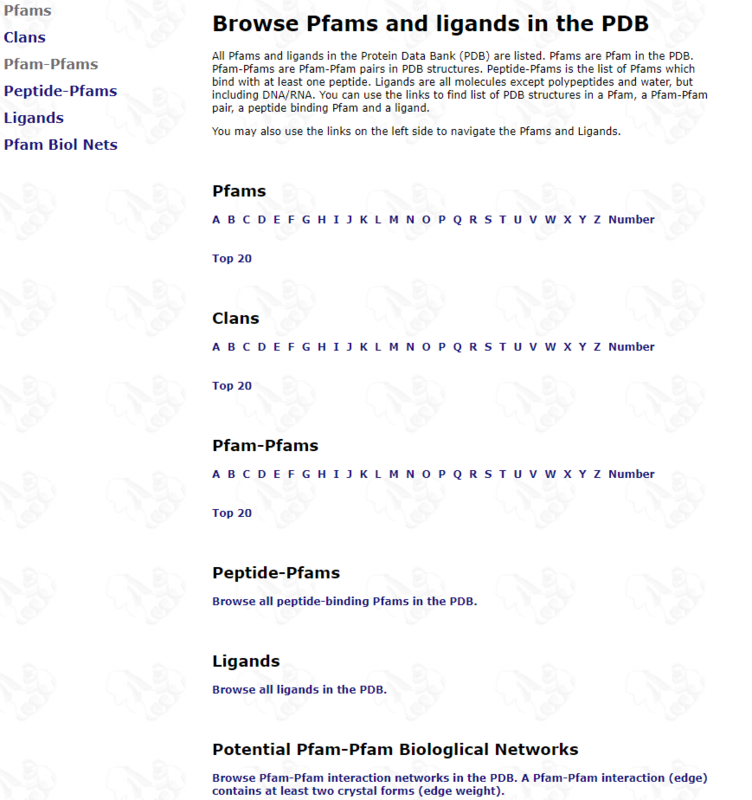 Pfams, Clans, Pfam-Pfam pairs, peptide binding Pfams, ligands and Pfam interaction networks can be browsed. 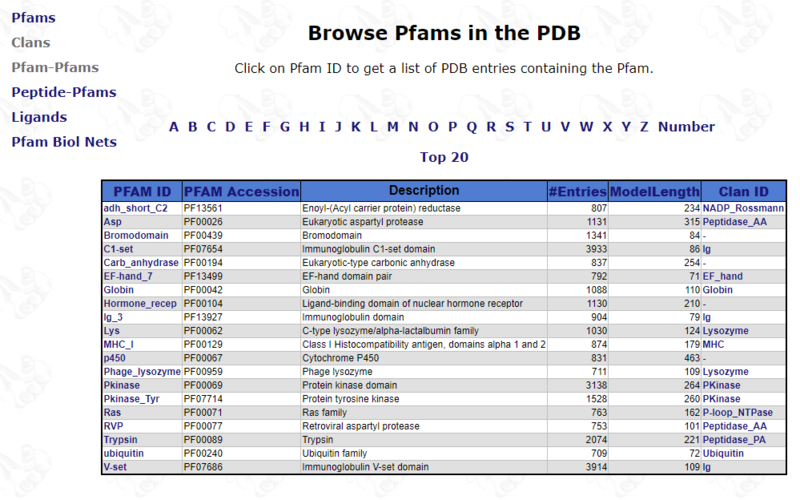 The Browse button provides access to all PFAM domains identified in the PDB. Use the links to find families that begin with the chosen letter or number. The column #Entry indicates how many PDB entries contain the Pfam, and the ModelLength is the length (number of match states) of the Pfam HMM model. You can select one Pfam ID, get a list of PDB entries which contains this Pfam. This is similar to "PFAM ID" search. For instance, click "Pkinase", and the table shown below appears; it lists all PDB entries with Pkinase domains (the image only shows a part of the list). The columns PDBID, Pfam Arch (the Pfam chain architecture which contains the Pfam domain), E-Value and Entry Pfam Arch (the PFAM architecture of the entry) are sortable. SeqBeg and SeqEnd indicate the positions in the PDB sequence that mark the beginning and the end of the alignment with the Pfam HMM. Clicking one of the PDBIDs produces the table of Pfam architectures for that entry, similar to a PDBID search. 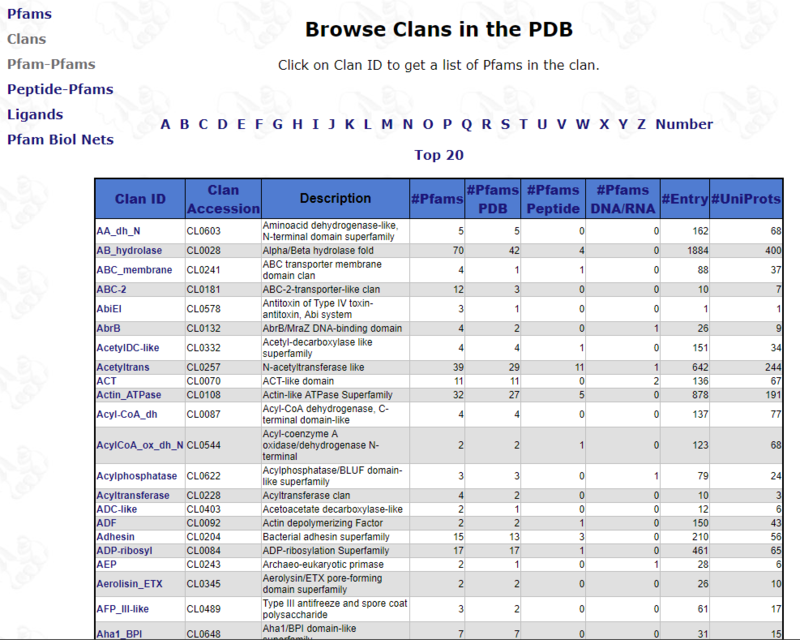 The Browse button provides access to all Clans (superfamilies) present in the PDB. The format is same as browsing "Pfams". Use the links to find clans that begin with the chosen letter or number. 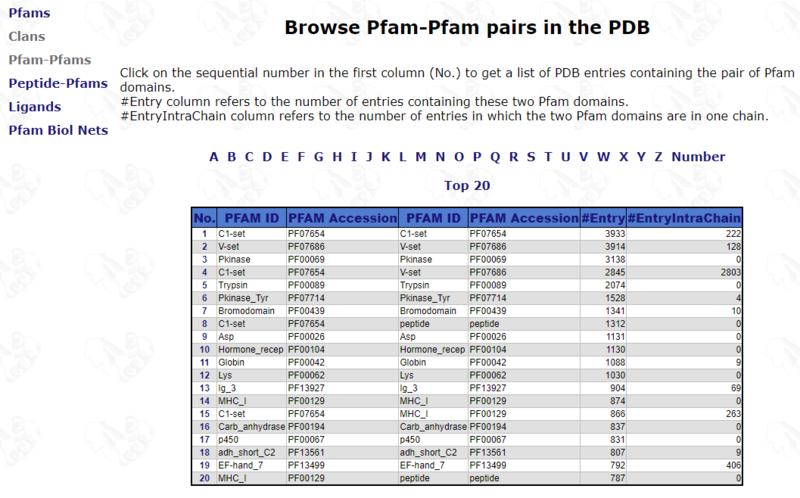 The Browse button provides access to all Pfam-Pfam pairs present in the PDB. The format is same as browsing "Pfams". Use the links to find Pfam pairs that begin with the chosen letter or number. 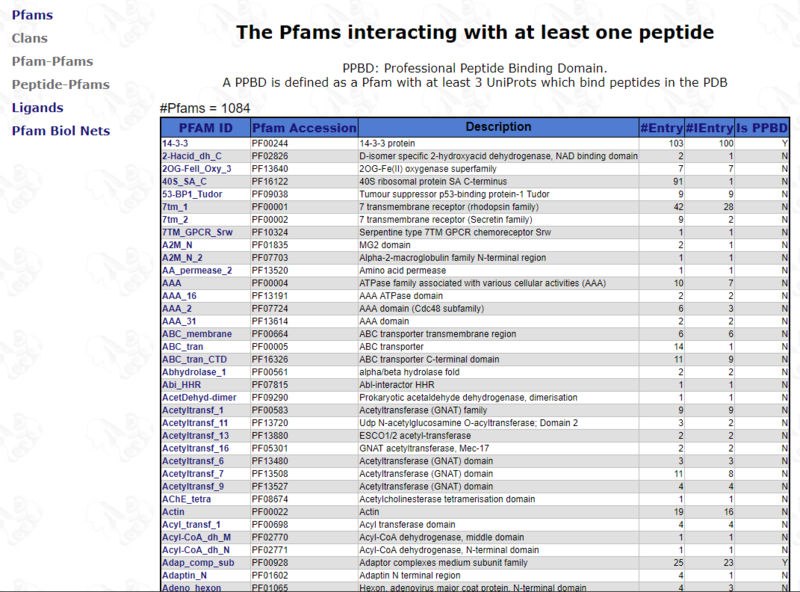 The Browse button provides access to all peptide binding Pfams present in the PDB. Click each Pfam to view the structures and clusters of Pfam-peptide interactions. 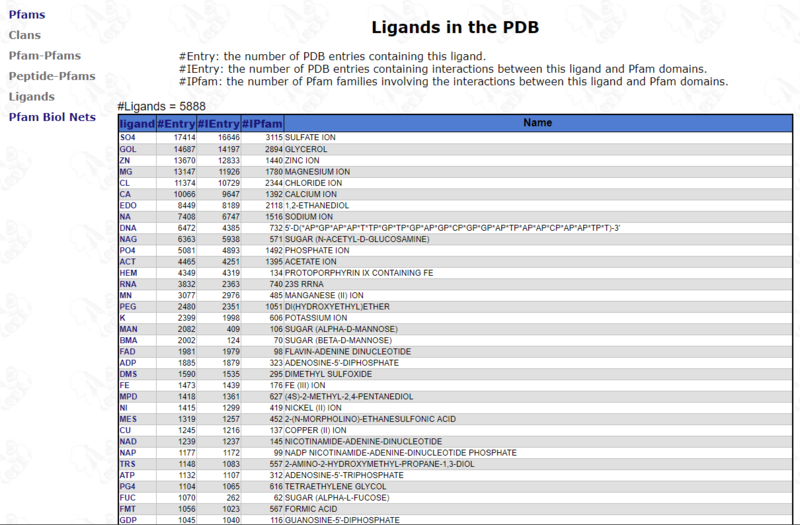 The Browse button provides access to all ligands except water molecules present in the PDB. Click each ligand to view all Pfams interacting the ligand and download the coordinates of Pfam domains containg this ligand and other ligands in structures. 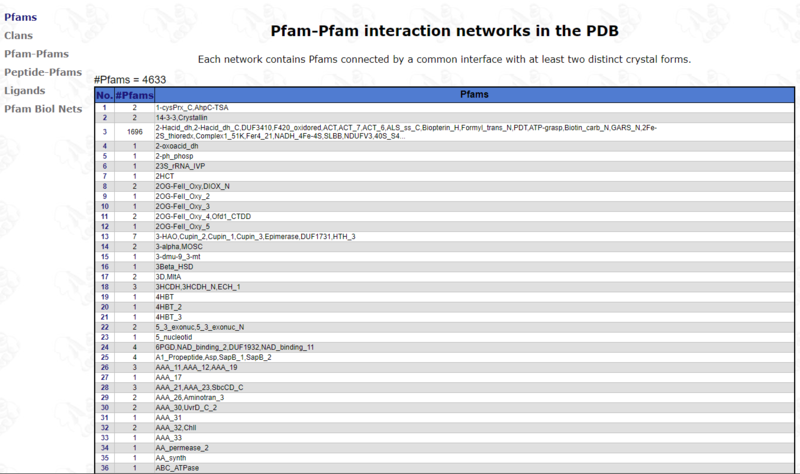 The Browse button provides access to potential Pfam interaction networks in the PDB. An interaction is represented if there are at least one cluster containing at least two crystal forms and minimum sequence identity < 90%.